They say the first step to recovery is admitting you have a problem. But the people who shape the future of greater Detroit — despite all the urban flight, sprawl, and decline they’ve seen — just can’t seem to acknowledge that they have an addiction to big highway projects. On the agenda Thursday for the regional planning commission, the Southeast Michigan Council of Governments, are two highway expansion plans that will cost an astounding $4 billion combined. On the one hand, some Detroit power players are starting to embrace sustainable transportation. Regional leaders recently brought together urban and suburban officials to create the first unified regional transit system for the area. The city of Detroit is working to add 100 miles of bike lanes this year. And then there are the plans for downtown light rail and bus rapid transit to the suburbs. Efforts like those provide hope that the Detroit region will reverse its decline and emerge stronger than ever. But amid the signs of progress are two highway projects that threaten to undermine the region’s recovery. The worst of the two, perhaps, is the $2.7 billion plan to widen I-94 through Midtown. SEMCOG and the political leaders who appoint its members apparently believe that ramming more than half a dozen new highway lanes through one of the city’s most promising neighborhoods will help stabilize Detroit. If you ask the experts, they strongly disagree. Model D Media reports that not only will this project soak up nearly $3 billion that could be used to advance the region’s transit ambitions, it will actually impede mobility for city residents. The project will eliminate 14 freeway crossings in the city, making walking and biking more difficult for city residents with limited options. “After removing these bridges, there will be a mile of impassable expressway,” Todd Scott of the Michigan Trails and Greenways Alliance told local website We Are Mode Shift. Local resistance to this project is, not surprisingly, increasing. The city of Detroit and Washtenaw County, home of Ann Arbor, recently passed resolutions opposing it. Similar legislation is being considered by Ferndale and Hazel Park, two inner suburbs. 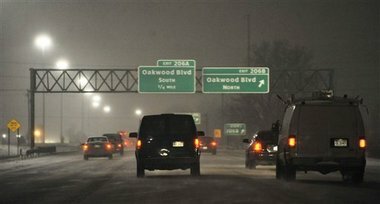 On Thursday, SEMCOG will vote on I-94 and another highway plan to expand I-75 through wealthy, suburban Oakland County. Together these projects represent $4 billion in planned spending. There is some concern that if the region were to reject these projects, it would forfeit federal money. But regional transportation officials have indicated that this money could be spent repairing the city’s existing roads, which are in terrible shape. Last year, a survey of the region’s residents found more than 90 percent said the roads are in fair to poor condition. Maintenance costs have doubled in recent years, local officials report, while the population has shrunk. Imagine how much good $4 billion could do the Detroit region if directed toward some of the region’s biggest problems. Model D Media points out that amount of money could fully fund Governor Rick Snyder’s $500 million bus rapid transit plans, and the remaining $3.5 billion would be enough to purchase a moped for every resident of the seven-county region (not that that qualifies as sound transportation planning). Or SEMCOG could restore the $7 million it recently stripped from the Detroit Department of Transportation (which runs the urban bus system) every year for the next 507 years. City residents in Detroit are still trying to cope with hours-long waits for the bus. Extravagant highway projects through city neighborhoods should be a non-starter. With this vote, greater Detroit has an opportunity to avoid repeating the mistakes of the past, to demonstrate that the region is looking ahead, that it has the vision to solve its formidable problems. Unfortunately, SEMCOG does not have a reputation for leadership or vision. The agency was recently subject to civil rights litigation for failing to represent the interests of the region’s black residents. Will regional leaders take this opportunity to forge a new path, or will they continue with their destructive asphalt habit? We have a similar problem with the highways in Chicago in that they isolate neighborhoods and are very difficult to cross. Why do planners continue to think massive highways will revitalize cities? Oy va voy. Highways highways highways. No more highways, please! 1. Road capacity projects are the ones that get federal funding (by statutory formula). Local electeds are left with a choice of building a road or building nothing. They like economic activity and job creation, even if temporary highway jobs . . . despite transit investments creating more jobs – and permanent ones. Some officials knowingly accept the trade-off because they can’t change the funding constraints. 2. Regional models need an overhaul, and not by the people that have vested interest in maintaining the status quo. Outcomes predicted by the models use past performance to project future return on investment. They are incapable of effectively weighing highway verses transit. They can evaluate highways, alone, and transit agencies do quite well modeling transit, alone, but when a highway agency advocating for a capacity improvement is involved, the models crash and burn in comparing reasonable alternatives. Perhaps it isn’t the model, but rather the agency controlling the model. In any case, and for example, a Chicago area model run supporting an onoging I-290 EIS predicted that despite extension of rail service combined with new BRT service to and from the region’s three largest suburban job centers, a partial add-a-lane with express bus on it generated more transit trips than the major investment in transit combined with congestion pricing. In fact, the model predicted that the transit and road pricing solution would result in a *decline* in transit ridership when compared to doing nothing at all. While seemingly counter-intuitive, or even plainly ridiculous, the study marches forward having accepted the analysis as true with the only explanation being that “there’s a lot going on in the model.” Ummmm, there sure is. Thus, unless funding streams and modeling errors can be fixed, avoided, or properly controlled, we are going to keep seeing highway projects that yield very little, if any, return on investment – more likely, they’ll simply continue to exhibit negative return on investment, all costs and impacts accounted for. Urban planners generally don’t think massive highways are great for urban areas – highway engineers do, and the politics and limitations of project financing and modeling allow them to continue their charade of making investments to solve congestion and improve safety. They make their decisions in ivory towers with basements filled to the ceiling with pieces of eight, far away from from the project areas they identify as being in need of major investment due to the presence of old highway infrastructure, geometric deficiencies, and capacity constraints. If you stand at the base of the tower, you can hear them chuckle, “We could do this job with our eyes closed”, with several replying that they’ve had blinders on for decades. Then they laugh in unison, oblivious to both the people that can hear them outside of the tower and those that – they say – will benefit from their efforts to continue to dump billions into incremental highway capacity while effectively ignoring the fact that there are other modes requiring improvement and expansion — far superior investment strategies for urban transportation. But then again, isn’t the solution to a weight problem simply buying larger pants? The road and bridges need to be replaced. Only 20 percent of the region's highways are in good condition. And yet the regional transportation agency is planning $4 billion in highway widenings.